Blogger's note: A spreadsheet error (mine) was overvaluing the Diamondbacks' chances by 2% and undervaluing Boston's chances by 1%. I have fixed the error going forward. 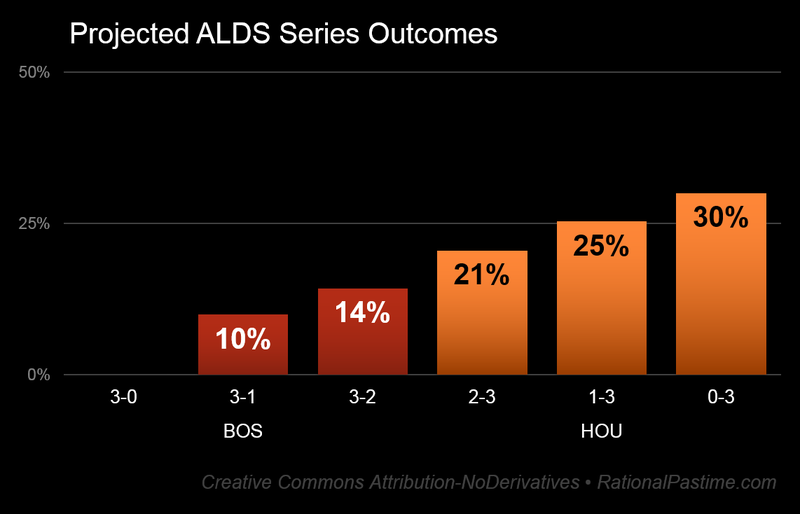 The Indians and Astros began yesterday's games as favorites and ended them even stronger. The first- and second-seeded teams in the American League downed the New York Yankees and Boston Red Sox by a combined score of 14-2. 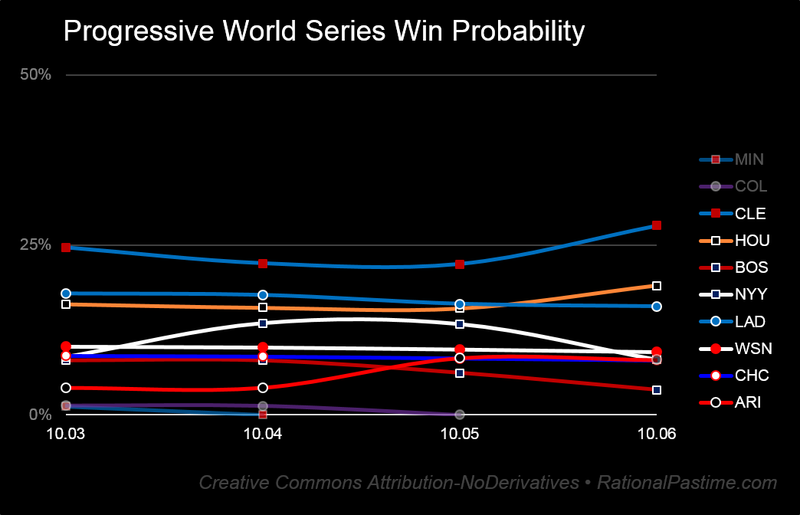 Cleveland's and Houston's odds to win the 2017 World Series improved to 28% and 19%, respectively. 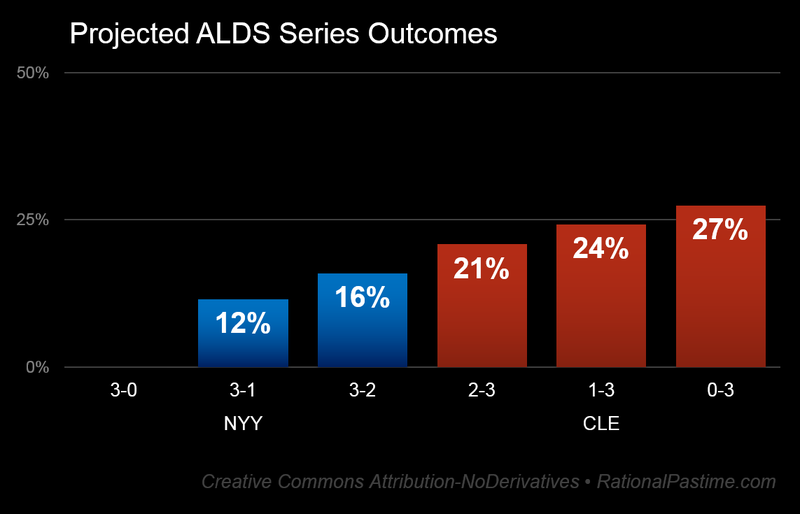 Conversely, the championship odds for the Yankees and Red Sox declined to 23:2 and 24:1. Boston's odds are currently the worst in the playoff field. 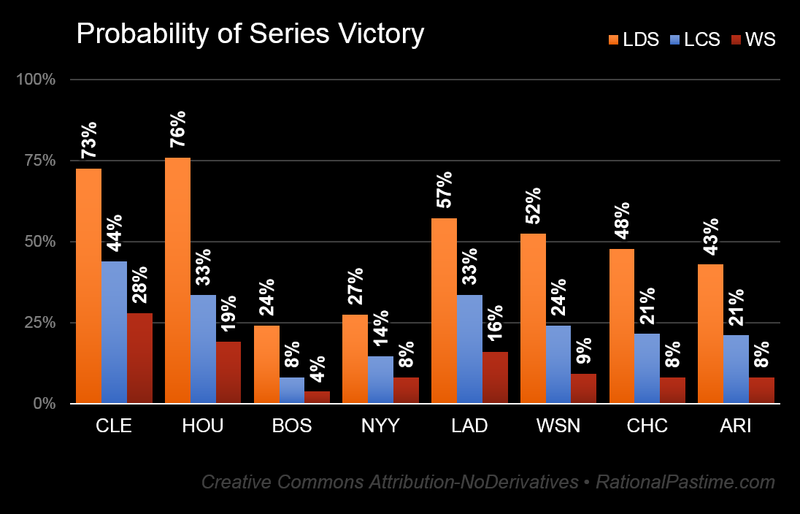 At present, a sweep is the most likely outcome of both series, while the underdogs will most likely need to force a fifth game to win (and, even then, they would likely still be underdogs). The single most likely World Series result remains Cleveland over the Los Angeles Dodgers in five games. National League play resumes this evening as the defending World Series Champion Chicago Cubs (still weird) head to Chicago to take on the Washington Nationals. The Nats are slight favorites to win their first playoff series. Later on, the Los Angeles Dodgers host the Arizona Diamondbacks (series projections for both matchups in yesterday's post). Tune in tomorrow to see how the result's of today's playoff contests affect the chances for each team in the field.